The first thing to mention here is that the documentary is pretty exclusively talking about feature films that were made around comic book properties. There's a minute or two that cover all of the serials, brief mentions of the live-action Superman and Hulk TV shows, and a couple of the early made-for-TV movies get a passing nod. For the most part, the documentary is looking at longer form, live action pieces shown in movie theaters. The only mention of cartoons is one line referencing the Grantray-Lawrence Marvel Super Heroes and Spider-Man shows as the Marvel's initial forays into something other than comics. Historians might note that last statement is untrue, as Captain America was featured in a 1944 serial and Sub-Mariner was optioned as a TV show in the 1950s. Although you could technically argue that the company wasn't called Marvel at the time. That's a lot of where I had problems with the documentary. The film itself wasn't bad. (Aside from using Comic Sans for all the on-screen captions.) But they played pretty fast and loose with historic narrative. Nothing blatantly wrong per se but they definitely presented things in a way which distorted the overall tapestry a bit. It's notable that they decided to almost exclusively focus on successful films. A single still image was shown from Howard the Duck and another from Tank Girl but neither are actually mentioned. No references at all to Barb Wire or Catwoman or League of Extraordinary Gentlemen. I should state, too, that by "successful" I mean "financially successful." Batman Forever, while indeed a financial success, is generally considered pretty bad; yet it still received praise in Comic Books Unbound. On the other end, the critically acclaimed Ghost World was never mentioned and a quick shot of the movie poster is the only reference to it. Mystery Men doesn't even get that much. And, for some reason, Men in Black is completely absent DESPITE being a financial and critical success. 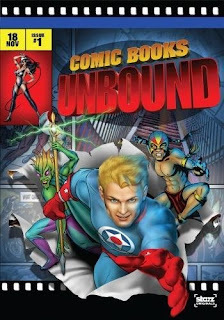 That's I think what makes Comic Books Unbound such a strange beast. They clearly went out of their way to get interviews with some interesting and knowledgeable people with a range of perspectives (Guillermo del Toro, Stan Lee, Zak Pen, Neal Adams, Roger Corman, Avi Arad, Mike Mignola, Paul Pope, Richard Donner, Jim Steranko, etc.) but they didn't seem to do much beyond the barest research. It strikes me less as a documentary and more as a promotional video that's meant to be shown to studio executives selling them how they should make comic book inspired movies. I think this is highlighted in the opening clips of the movie in which Ron Perlman says, "I think comic books are a natural jumping off point for really theatrical material" which is shortly followed up by Selma Blair adding, "The comic book genre makes them a ton of money." So why exactly is this commercially available if the intended audience are movie executives? I'm not entirely sure, but I suspect it has something to do with that "ton of money" comment.